Unlike peers, the company has maintained its dividend throughout a slumping fertilizer market. But investors are betting that will soon change. Shares of leading fertilizer producer Mosaic Company (NYSE:MOS) dropped 16.1% last month, after investors received their quarterly distribution in late August and then calmly headed for the exits. Second-quarter 2016 results, announced in early August, point to a simple explanation: Investors think the company's dividend will be cut before the next distribution later this year. Despite falling share prices, several major producers of agricultural nutrients had managed to steadily raise their dividends in the past five years. But lingering headwinds in the fertilizer market, namely selling prices that are taking longer than expected to recover, have forced both PotashCorp (NYSE:POT) and Agrium (NYSE:AGU) to cut their dividends in 2016. Potash slashed its quarterly payout 34%, while Agrium investors were forced to stomach a 27% reduction. 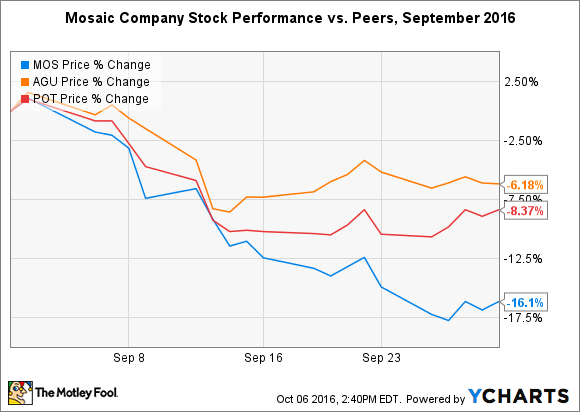 Mosaic Company has so far managed to avoid a similar fate, but a net loss in the second quarter of 2016 hinted that it wouldn't be able to resist for much longer. More importantly, the company achieved an ominous milestone during the quarter: free cash flow per share ($0.973) dipped below dividend payouts per share ($1.10) in the prior 12-month period for the first time since mid-2013. That achievement, combined with a challenging market outlook for 2017 and 2018, makes it likely that Mosaic Company will have to join peers in slashing its dividend. It appears that, while the writing was on the wall since second-quarter earnings were released in early August, investors were waiting to collect quarterly dividend distributions before selling out of the stock. You had to own shares on Sept. 8 to receive the distribution. While the announcement of a dividend cut could have a negative impact on shares, investors may want to consider that market headwinds are already priced into shares. Mosaic Company sports a current price-to-earnings ratio of about 15.7 -- slightly higher than Agrium and much lower than PotashCorp. That doesn't mean shares won't slip further on more bad news, or that investors shouldn't look outside the fertilizer industry for better investing opportunities, but a drastic knee-jerk reaction to any potential news could signal a buying opportunity for long-term investors.